NEW YORK - Norval Morrisseau, also known as Copper Thunderbird, one of Canada's most celebrated painters and an important influence in the development of North American indigenous art, died Tuesday in Toronto. He was thought to be 75, although his birth year has been listed as both 1931 and 1932. The cause was complications of Parkinson's disease, said the Assembly of First Nations, which represents Canadian Native tribes. Mr. Morrisseau, an Ojibwa (also called Anishnaabe or Chippewa) shaman, was one of the first native painters to adopt modernist styles to convey traditional aboriginal imagery and to have a crossover career in contemporary art. His style, which became known as Woodland or Legend painting, evoked ancient etchings from birch-bark scrolls and often used X-ray-like motifs: skeletal elements and internal organs visible within the forms of animals and people, and black spirit lines emanating from them. "Saturated with startling, often contrasting colors, such paintings appear to vibrate under the viewer's gaze," said the National Gallery of Canada, which organized a retrospective of Mr. Morrisseau's work in 2006, the first solo show for a native artist in the institution's history. It is on view in Lower Manhattan through Jan. 20 at the George Gustav Heye Center, part of the Smithsonian's National Museum of the American Indian. Of a 2001 New York show of Mr. Morrisseau's drawings, made on sheets of paper towels while he was in jail in Canada in the late 1960s, Holland Cotter of The New York Times wrote: "The results aren't ingratiating or beautiful. Like visionary work in many cultures, they're aggressive, sometimes violent, as much about fearfulness as about transcendence." 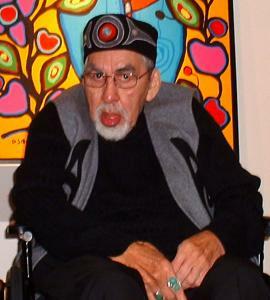 Born Jean-Baptiste Norman Henry Morrisseau in northern Ontario, he was the eldest son in a family of seven and was brought up, according to tradition, by his maternal grandparents. His grandmother was Catholic and his grandfather, whom he described as his most important influence, was a shaman. Their discordant views formed the background for much of his early life and his development as a self-taught artist working between two worlds. He was believed to have been given his native name in his teens, when he became seriously ill. He said his life was saved by a medicine woman who renamed him, calling him Copper Thunderbird; a thunderbird is a powerful symbol in Ojibwa folklore. Mr. Morrisseau, who dropped out of school at a young age and lived much of his life in poverty even after becoming established, was known as a charismatic, often unpredictable figure in the art world. He frustrated dealers, sometimes calculating his paintings' worth not by their quality but by the square inch ($3.55 at one point, according to a gallery owner). He battled alcoholism his whole life, and at a low ebb in the 1980s, living on Vancouver's streets, was known to trade his work for liquor money. But after the tremendous success of his first exhibition in Toronto in 1962, he was also often prolific and showed his work around the world. Marc Chagall, who met him in Paris when both artists were having exhibitions there, compared him to Picasso. In his later years, as accolades piled up, his life became more orderly, and he continued to paint until 2002, when Parkinson's left him unable to do so. In 2005 he was elected to the Royal Society of Canada. He was also awarded honorary doctorates from McGill and McMaster universities and received the highest honor awarded by the Assembly of First Nations, the eagle feather. "Why am I alive?" he said in a 1991 interview with The Toronto Star. "To heal you guys who're more screwed up than I am. How can I heal you? With color. These are the colors you dreamt about one night." He leaves numerous children and grandchildren.